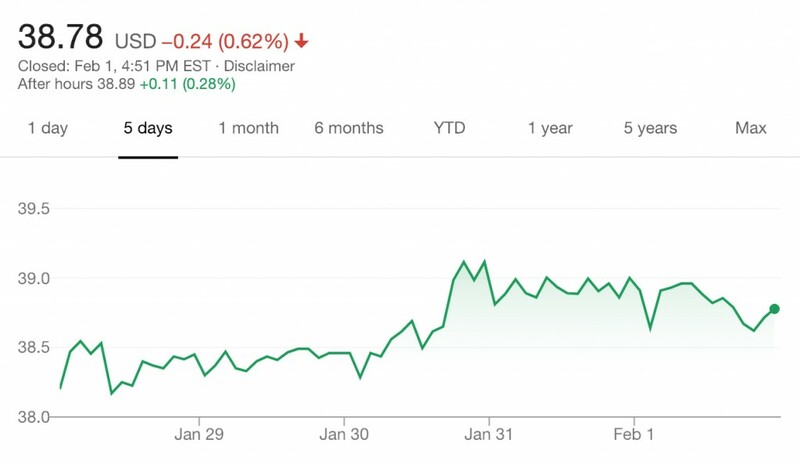 The value of GM stock increased 1.4 percent or $0.55 per share during the January 28th, 2019 – February 1st, 2019 timeframe, closing the week at $38.78 per share. This marks the fourth consecutive week during which GM stock saw an increase in value. The boost continues after the Detroit Auto Show, where GM unveiled the Cadillac XT6 crossover SUV and pre-announced an electric Cadillac crossover. We also believe that the investors conference held by GM prior to the start of the Detroit auto show continues playing a role in the ongoing rally for GM stock. During the conference, the automaker presented its strategy for new models intended for developing markets and several future Cadillac vehicles and how they will contribute to its bottom line. The culmination of the governmental shutdown may also be a contributing factor to the ongoing rally for GM shares. Stocks go up and down daily…but most likely is Mary Barra admitting more production needs to be done in the U.S. in the near future. By stating this, she is in line with the governments economic agenda and therefore doesn’t scare investors. Much of what she is doing will pay off in the future. Getting a GM fiscally fit and cost in line will help in the tough market that lies ahead. Unfortunately we have heard that story many times from GM. What’s different? Always broken promises and Mary is no different…Profits and sales declining, product mistakes. It is good to see her lay off her political bias and come to grips with reality that America is headed in a new and fresh direction. You need to understand the big picture this time. First GM has unloaded much of what was killing them in the past. Too many brands, too many models, too many plants, too high cost, too much debt all managed by leaders not will to make changes or unable to make changes. GM for too long built tons of cars at a loss because the loss was less than if they closed the line. Poor union deals made it nearly impossible to clos3 a line. Today GM has cut cost, killed slow selling models, invested in the most popular and most profitable models. Killed money losing markets and brands. These moves are important because the future markets will shrink and growth is not going to happen. The key for every mfg is to cut cost and increase profits per unit to keep companies viable. The things all MFGs will do will not always be popular but will prove life saving for most. It is no longer business as usual. The future will be less must produce more income. While this is going on they all will still need to invest in the future to meet tougher standards while development cost are to the point most can not do it alone. GM is in a position to be the one who takes in a partner to share cost vs being the one needed a partner to survive. Though it does appear to be painful based on the process that they need to go through right now (In terms of Massive Layoffs), just as they did with Pontiac, Oldsmobile, Saturn and Hummer, in order to have a sharper focus on a smaller portfolio along with their recent re-introduction of their Commercial Vehicle Line Up, truly makes since at the end of it all. Name one GM restructuring that lead to long-term growth for GM. Since the restructurings of GM that started under Roger Smith, GM has shrunk itself and ultimately lost market share. Ford, Toyota and even FCA are within striking distance of GM in terms of sales and may unseat them this year as the sedans go away. If GM closes Hamtramck and Lordstown, they will have about the same size manufacturing footprint in the US as FCA and Ford. Again you prove you have no clue. Total sales in the coming market mean nothing. It is profitability in a contracting market that plays the lead roll. GM went broke building millions of cars. #1 none of the restructuring before the bail out was meaningful as they did not cut what really was needed or replace what was failing. #2 sure Ford and FCA are selling a lot of cars but they are not making much if any money. Ford is now to a point they need to shar platforms and major components to move forwards. They can not do much on EV so they will go in with VW. If it were not the Ford Family owning a majority of the company they would have been bought out. #3 you fail to grasp that GM has had too much capacity for too many decades and plants need to be consolidated and closed. That is the formula of non profit and bankruptcy. You just think it is all about going big but it is not. It is now becoming more about making money not volume alone. GM went broke thinking as you do. Just as if we went broke you need to step back and get on sold financial ground with your house in order before worry about risky growth. GM went broke due to legacy costs and could not buld competitive vehicles and make money therefore It built uncompetitive vehicles and lost money thus bankruptcy. Mary Barra inherited a healthy company with a clear balance sheet. Since then the stock has gone nowhere and they’re still losing market share and closing plants and laying off employees. They’re also introducing vehicles that are barely competitive let alone global benchmarks. They say they’re preparing for EVs and Autonomous vehicles when that market is perhaps a decade or more away. Since they don’t build a single vehicle now that leads how do they expect to lead in future or even inspire the market to promote the stock? A lot of people forget the debt load that GM is saddled with as well. Look, we know the IPO was $33. It dipped to $17/18 (buy signal) and has since danced in the 30s for 10 years (save the random turtle head poking up above $40). Is the recent upswing due to plant immobilization & next week’s layoffs? I bought into the IPO, then tired of the horizontal mambo – not the good kind ;-). GM’s still in index funds, so there’s no escape. GM has appreciated 1.8% a year since the IPO – ok, plus dividends. But one meaningful report per month is enough – right now, it feels like looking @ my 401k too often. I too noticed Miss Barra laid off her political rhetoric recently and is now somewhat willing to work with our President in re-establishing American manufacturing and jobs…and GM’s stock suddenly went up as a result. I see the biggest problem for this capital intensive industry is the risk of recession. In this industry, you need profitability on all of your facilities so that you can survive the next downturn. I am not predicting a recession; but this is a risk that these companies must prepare for and that preparation has to be done during the ‘good’ times. MB was given her job by the previous administration so they could break some imaginary ceiling. She very much cares for and loves GM but in the typical liberal world feelings are not reality. GM IS failing due to these “leaders “. Again they make zero global benchmarks and tho I want Cadillac to rule the XT6 will not set a new benchmark or establish itself as THE vehicle to have in its segment. It’s barely competitive and I predict the new Hyundai/Kia (Palasade/ Telluride) and Lincoln Aviator will eat this thing. Why? Because this is what they think we want and for being wrong they should be fired. They’re not building vehicles to grow sales or market share only short term profits to increase their bonuses..
GM is now profitable. Third quarter earnings are: Income of $2.5 Billion and EBIT-adjusted of $3.2 Billion. I believe all of their core business are operating at a profit. Looking at the profit picture and the vehicles that are coming out drove the stock price to it’s current level. As far as sales, I believe for the last 5 years they have sold more pickups in the US than any other manufacturer. 2018 sales of crossovers (not SUV’s, there is a difference) are up over 2017 for Terrain, Traverse, Equinox, Trax, and Encore. Personally, I don’t think the ‘non-automotive’ top management of this company; after the great recession helped GM in some areas. For example, platform consolidation and the pipeline of new vehicles. These are the areas being rectified now.. So the interim report on GM is that it is a financially healthy company. Now From a product point of view, look at what’s in the GM pipeline and see how these new vehicles are received. I went to the Chevy dealer for the 2nd maintenance visit on my car and wanted to look at the new Blazers. What came in has been sold. None available for display. Warren Buffet holds over 51 million shares of GM. He started buying 4+ years ago, and has added along the way. Despite many analysts, GM earnings per share continue to exceed most all forecasts, as GM ‘s management continues to raise guidance. GM is growing with products and markets that generate higher margins, and shrinking in products and markets with very low margins with weak potential, due to number of factors. Last year, GM’s stock came under pressure due to continual interest rate increases and a trade war with China. Both of these issues are now looking much better and should help GM shares move higher. Short term and looking strictly at stock value, their plan might work. It isn’t rocket science, cut costs, increase what gives you the most profit, and any company will look great to those with already enough money. But they are putting all their eggs in one basket again, forgetting the lessons that should have been learned in the not too distant past. Trucks and SUVs won’t sell when the economy takes a dive. “Not enough time to switch production to smaller vehicles” was one of the main excuses used in 08 when asking for a bailout. Business types, bean counters are still running the show. They exist in all car companies, but elsewhere they get shut up by the engineers, and guys with car sense more often.